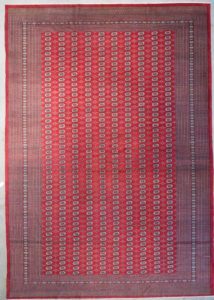 The term “Pakistani Bokhara” is used to describe modern Tekke-faced rugs made in Pakistan, which are among the most popular handmade rugs in the world. The most important of the Turkoman tribes in the nineteenth century was the Tekke. They occupied most of the habitable part of what is now the Turkoman S.S.R. (Turkmenistan) between the Caspian Sea and the River Amu Darya. In the course of the first half of the century their territory expanded to engulf that of other tirbes, in particular the Salor and later the Saryk in the valley of the Murghab between the Merv (Mary) oasis and the Afghan frontier. Bukhara Rugs are usually made by nomads on horizontal transportable looms with a different weave to Pakistani Bokharas, and generally are based on the Senneh knot (referred to as “double knot” in Pakistan). The wool pile of the rugs is far shorter than Pakistani Bokharas and the design is more intricate, requiring a higher density of knots. The colours of the Central Asian Bokharas are also predominantly rust, red, and brown. The feel of the pile is generally tighter and denser as a result of different wool and greater clipping of the pile. Both vegetable dye and synthetic dye Central Asian Bokharas can be found. It is also widely believed that the Tekke tribe used some design techniques they learned from the Salor tribe. 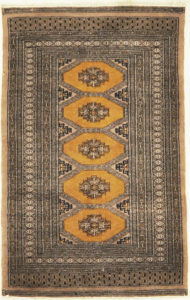 The rugs from the Tekke tribe were mostly traded in the markets located in Bukhara. Eventually these rugs just acquired the name of the city where they were commonly traded. However in some parts these rugs are still known as “Tekkes” but not in the United States. Bukhara rugs are now made in many countries and the design is even duplicated in machine made rugs. Some countries still hand knotting the Bukhara design are Pakistan, Iran, India, Turkey, Afghanistan, and Central Asia. Often featuring a distinctive elephant foot motif in their original incarnation, it’s fair to say this type of rug has remained globally popular for centuries. Central Asian Bokharas are known for their beauty, high quality, and durability. Using a combination of NZ worsted and local Pakistani wool on a cotton base, the Pakistani Bokhara has a very soft and thick pile. The length of the pile varies depending on the clipping of the particular rug. Sometimes the pile is intentionally left significantly longer, called “double pile”, resulting in extra thickness and depth – although there is a trade-off with the clarity of the pattern. The Tekke illustrated has several features which suggest an early nineteenth-century dating. It has less than 300,000 knots/m2 (194 knots/in2), counting 40 knots to the decimeter (about 10 per inch) across the width and 72 per dcm (about 18 per inch) along the length in the typical flat-backed double-weave structure. Tekke-faced rugs are still made by weavers in and around the city of Bokhara in Central Asia, although these are more difficult to find. There are different styles of Bukharas depending on where they are made but they will all be dominated by rows of guls that have geometric designs surrounding the guls. Some will have more variety of colors, use wool or silk foundation yarns instead of cotton, leave the pile height longer, or use different style of knots. However they are all still considered Bukharas because of the design. 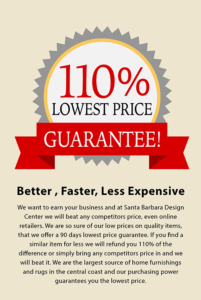 Come and stop by our gallery to find Fine Bukhara Rugs at 410 Olive Street Santa Barbara CA 93101. Vintage Bokhara is a term commonly used to describe Tekke-faced rugs. Tekke was a tribe from the area of Bokhara in Central Asia. The design is dominated by rows of guls and surrounding geometric patterns. Bokhara is a term commonly used to describe Tekke-faced rugs. Tekke was a tribe from the area of Bokhara in Central Asia. The design is dominated by rows of guls and surrounding geometric patterns. 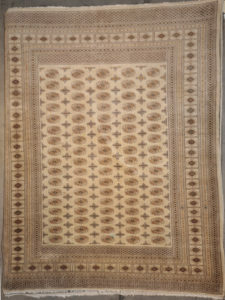 A classic Tekke-inspired Gul pattern with surrounding geometric design. The intricate weave along the border is an amazing tribute to the weavers.